There’s no special reason to display this graphic yet again — except maybe for the fact that (a) Jeb Bush is once more begging us to stop blaming stuff on his brother, (b) the Republican Party is about to embark on yet another nonstop yakathon about how the budget deficit is going to doom us all, and (c) the doom-monger in chief, Paul Ryan, will be speaking in prime time tomorrow. Plus Ezra Klein reminded me of this today. Click the link if you want more detail, but I think the chart pretty much speaks for itself. 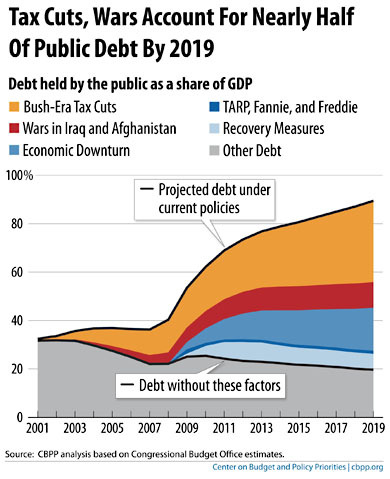 Nearly every single thing driving the current increase in public debt — tax cuts, wars, the recession, and measures to fight the recession — was a result of Bush-era policies that were enthusiastically supported by nearly every single Republican currently hanging out in Tampa. They only got religion after a Democrat won the White House and had to clean up the mess they left behind. Their success at convincing half the country that Barack Obama is responsible for our soaring debt is surely one of the greatest political propaganda victories of all time.